The fourth installment of Assasin's Creed probably has the best artbooks in the series. The Art of Assassin's Creed IV: Black Flag is an awesome artbook. 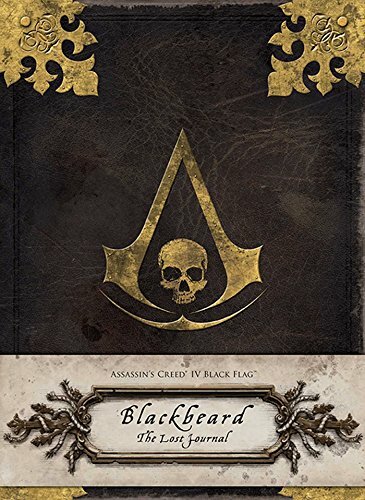 And this Blackbeard's journal is also pretty good. The first thought that came to my mind is "What?!? You mean Blackbeard can write?". LOL. They addressed that very quickly by saying that all that's recorded in the journal are done by a artistic crewman. That makes more sense. Collected within this book are journal entries of the infamous pirate captain Edward Thatch, aka Blackbeard. These are his adventures, his thoughts on the events that unfold and observations on the unknown pirate Edward Kenway (of course we know who he is). It's an interesting read that is essentially another window into the Assasin's Creed world. The actual author of the book is Christie Golden, an American writer who has written over 50 novels in the fantasy, horror and sci-fi genre. Christie definitely has flair when it comes to writing such stories of pirates, treasures and fighting. The first person account from Blackbeard is very engaging. The other highlight of the book is the amazing art. Contributing artists are Vance Kovacs and Ben Andrews. A good number are pen and ink style art. They used traditional pen and ink style with all the amazing hatching techniques and applied it to game art. I love the details and just how striking and bold the artworks look. Just amazing. In addition to those, there are also several concept art style coloured paintings. Those are gorgeous as well but you would have seen them in the AC IV artbook. The whole book is designed to look like some old journal. Inside there are many inserts plasted onto the pages, such as maps, poker cards. It's a nice touch that makes it not only look like a journal but also feel like one. It's a fantastic video game companion. Highly recommended.